Shih Tzus have long hair that needs to be maintained constantly, particularly if you’re not cutting your pooch’s hair short. Ensuring that you brush and cut your dog’s hair regularly will ensure that there is less matting and less chance of your pup getting an infection of some sort. Here are some instructions on grooming different parts of your Shih Tzu’s body. Frequent brushing will help you keep your pup tangle-free. It’s best that you start at the top of the head and use a combination of a bristle brush and a comb. Pay attention to the area around the ears, since that is a popular place for mats to form. Once you have smoothed out the fur, shorten the hair around the pup’s eyes and mouth, since this will help them see and keep their face from getting too dirty. For those who decide to keep the fur long, many will create a top knot as part of the grooming regimen. This is used to keep the hair out of their faces. Using a pony tail or knot will do well, however some have done braids or twists. No matter what it is you decide to do, make sure that it is something that is comfortable for your pup and won’t easily get tangled in things around the house. 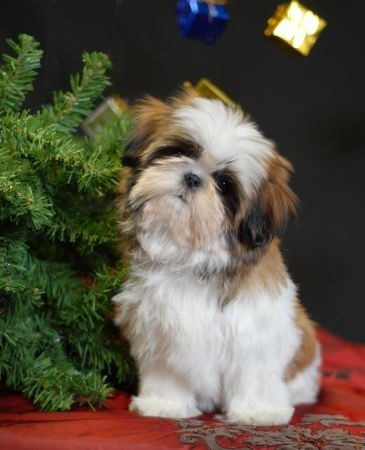 It’s possible that your Shih Tzu will develop some discharge around the eyes (this is totally normal). While grooming your pup, take a damp (preferably warm) cloth and wipe around your dog’s eyes. Please note that persistent red or brown stains might be a sign of a yeast infection or other problem that you should discuss with your vet. Again, use a comb and bristle brush in order to brush out your dog’s coat to remove any tangles you encounter. Pay special attention to joints of the body as mats tend to form there. Divide the fur as much as possible, so that you are brushing right down to the skin. Remember to be gentle with your pet! While inspecting your dog’s body make sure to clip their toenails, without hitting the quick. If you’re not comfortable with this part, then find a local groomer who can take care of it for you. You don’t need to bathe your pup every time you do a grooming session. Particularly if you have left the fur long- that could take a while to clean. If you give them a bath, do so after brushing because getting a bath can make tangles worse. Make sure you rinse thoroughly because leftover shampoo can make your pet’s skin dry and itchy. Wrap them up in a towel to dry and do this twice with new, dry towels. To finish, blow dry them to leave their hair silk smooth!